Muscle Milk® Light Bars deliver the same phenomenal taste as our Genuine Muscle Milk Bars, but with 43% fewer calories. Each bar is packed with 15 grams of high-quality protein, complex and simple carbohydrates for stable energy levels, and contains NO Lactose or trans-fats! These delicious treats are ideal when you want a nutritious, convenient snack to tide you over between meals. They are also the perfect calorie control snack for weight management programs. Muscle Milk Light Bars deliver the satisfying taste and healthy sustained energy of Muscle Milk in two delicious flavors to make your taste buds happy: Chocolate Peanut Caramel and Vanilla Toffee Crunch. Premium Protein Blend: 15 grams of high-quality protein. Zero Tolerance: ZERO Lactose and trans-fat free. 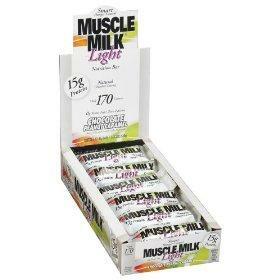 Buy MUSCLE MILK LIGHT BARS Now!